The Hmong have been a distinct population for millennia, first in southern China, more recently migrating south into what is now Laos, Cambodia and Thailand. During the Vietnam War the CIA employed many Hmong as a proxy force fighting against the Pathet Lao. When US forces withdrew from SE Asia, the Hmong were left to fend for themselves and suffered terribly. Recently many Hmong have been admitted to the US as refugees. For reasons not entirely clear to me a sizable fraction settled in Saint Paul. The Hmong have a strong presence in the Frogtown neighborhood, a little west of the Capitol, with a concentration around University & Western Avenues. 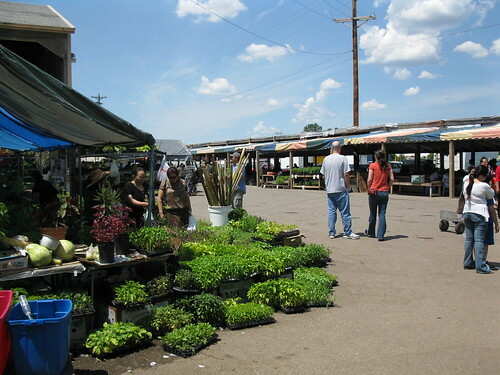 My first stop was International Market Place, sometimes called the Hmong Market or simply the Flea Market. This was unquestionably the highlight of my entire stay in the Twin Cities. I enjoyed it so much I made several visits. In its former life IMP was a lumber yard, consisting of two large buildings and some open sheds. The building barely visible on the right is divided into many small stalls, some selling kitchenware, crafts, dried herbs, hand-forged gardening equipment and much more. 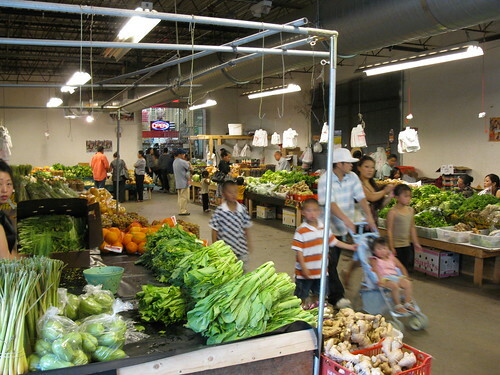 It also has a separate room housing fresh produce vendors. I believe nearly all of the many vendors are Hmong. Outside by the sheds are the live plant sellers. 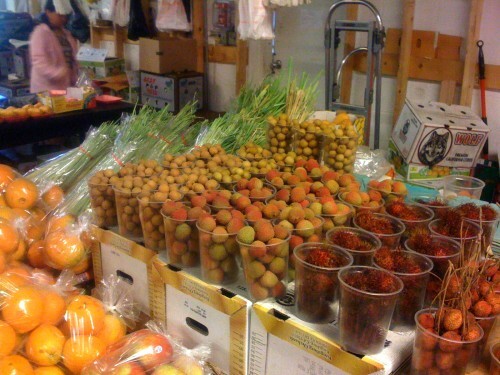 Much of the stock consists of Hmong culinary and medicinal herbs. There's the usual cilantro and lemon grass of course but there are dozens of plants I never saw before. The photo shows only a fraction of what's on offer; really a remarkable collection. I bought some plants to bring home with me and this might be the subject of another post (once I figure out what I have!). The building on the left is filled with more small stalls with an emphasis on clothing and videos. It also houses the food court, a fascinating area to say the least. Unfortunately photography is discouraged in this building so I can only show you some food I carried away. Hmong cooking has of course been influenced by other cuisines of SE Asia but many of the classic Hmong dishes are quite distinct. Two hallmarks are less aggressive seasoning and reliance on a large variety of fresh herbs. 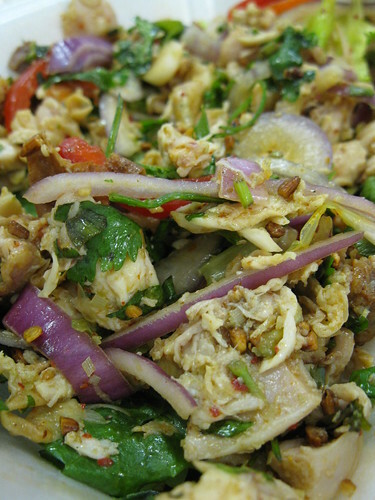 I started with chicken larb, a common Laotian dish. This was an excellent coarsely textured version, heavy on herbs and toasted ground rice. From the same vendor I also bought some chicken (and tofu?) meatballs. These had a nice light texture and were filled with minced herbs. Traditional Hmong long sausages were everywhere. These coarse-textured beauties were simply seasoned with garlic, ginger and scallions. The complex sour and slightly hot sauce was a great accompaniment. Hmong cooks are well known for using every part of the animal, exemplified by this gizzard salad. I had doubts while ordering but it was very good. These stuffed chicken wings are reportedly a recent adaptation of Hmong cooks. The stuffing was simply well-seasoned, coarsely-chopped chicken meat. The salty, sour dipping sauce was phenomenal. University Avenue has a large number of Hmong shops, some clearly identified (e.g., Hmong Video), some not (just look for those unpronouncible words). Paj Tawg, on University & Marion directly south of International Market Place, is one of the larger ones. They carry an interesting mix of groceries, cooking equipment, dry goods, textiles and beads. The Hmong are famous for their embroidery. If you want to try your hand at this art, this is a great place to stock up on supplies. One of the most impressive shops on University is Hmong Arts, Books and Crafts, one of the world's very few Hmong bookshops (remember the Hmong written language is barely fifty years old). This is a beautiful shop, clearly a labor of love by its owner. One room is devoted to books (a surprising number) and crafts; the other has mostly clothing and textiles. Some similar items are available from the stalls at International Market Place but most of Hmong ABC's stock is on a different level. I would consider some of the textiles to be near museum quality (with commensurate prices). 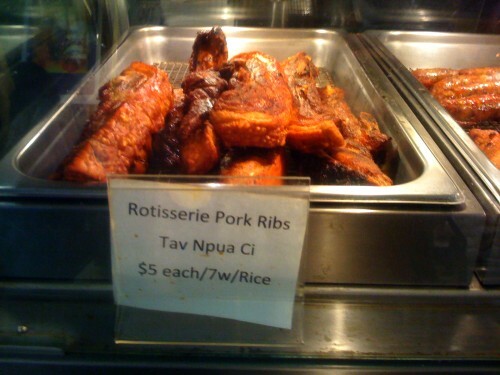 The owner is a font of knowledge on all things Hmong. Despite the large Hmong population in Saint Paul, there are surprisingly few restaurants. 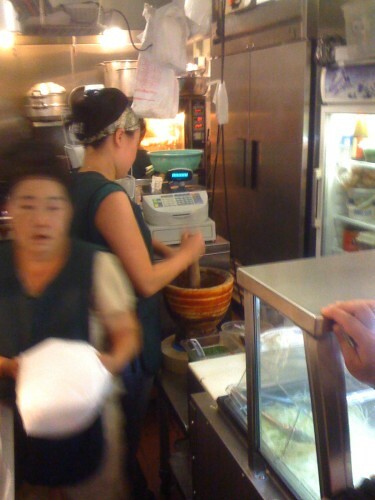 Those Hmong who run restaurants usually specialize in some other cuisine, such as Thai or Vietnamese. Other than the International Market Place the only other source I found is the deli at Sun Foods. I had a tough time finding this place as it used to go by another name (Foodsmart). Sun Foods is an impressive multi-national market roughly similar to Chicago's Broadway Market. Sun Foods has a nice little deli serving prepared food to take out. Much of it is Thai but I think the cooks are all Hmong so they prepare these slightly differently and they also make occasional Hmong standards. This is, of course, the green papaya salad ubiquitous in SE Asia. When I asked the extremely helpful young woman who was taking orders what made it Hmong style she explained, as if speaking to an especially dense six year old, "A Hmong is making it, so it's Hmong." I asked the older Hmong lady who prepared the salad to make it the way she would eat it. I was rewarded with an excellent version but much fishier than any I've had. She added fish sauce, dried fish chunks and (I think) some sort of fish paste. I later read that this is not atypical. This tub, that would easily serve four, cost $2.99, an amazing bargain. Some of the Thai-style curries looked pretty good but I was determined to stick to the Hmong dishes. The first name refers to a very traditional Hmong beef soup but I'm not sure if this more stewlike version would be the same. I also got another Hmong sausage since I had enjoyed the first one so much. Quav Iab Nyuj illustrates the Hmong passion for using the whole animal. This dish contained a surprising variety of "inner meats" and was seasoned with bile. Let's have a closer look. Tripe, tendon, fatty bits, lean muscle and more, it was all there. Truly an astonishing array of textures. For an offal-n-bile stew it was surprisingly enjoyable. I can't recommend a visit to Frogtown highly enough, especially International Market Place. Poking around on your own can occasionally be frustrating (due to language) but ultimately is extremely rewarding. Some festivals are coming up that may be of interest to visitors. Hmongtown Festival (details below) takes place June 27-28, 2009 [note added: it looks like this festival has been canceled]. Hmong Sports Tournament takes place the following weekend, July 4-5, 2009. Later in the year is the Hmong New Year Celebration, November 28-30, 2009. I really don't know much about these festivals but I bet all would be worthwhile. Finally, a note on Hmong written language. The Hmong language has traditionally been spoken only, but in the 1950s, Western missionaries devised a written Hmong language, the Romanized Popular Alphabet. The fifty-some consonants are rendered by Roman consonants, either singly or in combinations (double, triple, quadruple). The fourteen vowels are indicated by various combinations of a, e, i, o, u and w. In general words are monosyllabic but can be spoken with one of seven tones. The final consonant indicates the tone. This explains a bit about words such as ntxwm (part of the word for sausage): a combination of consonant (ntx) + vowel (w) + tone marker (m, indicating the low-falling tone). A general introduction can be found here and here is a dictionary with useful background. Edited to repair photo links. Last edited by Rene G on September 4th, 2014, 11:09 pm, edited 2 times in total. Recently many Hmong have been admitted to the US as refugees. For reasons not entirely clear to me a sizable fraction settled in Saint Paul. My fiance's father lives in Minneapolis and from what I understand, Lutheran missionaries encouraged the Hmong to move to MN. What a wonderful report, Rene G, that I will try to share with the future father-in-law, even though he and his partner are not very adventurous eaters. Coupled that with my vegetarian fiance, I might have to visit some of these places on my own the next time we make our way up north! Rene G wrote: I can't recommend a visit to Frogtown highly enough, especially International Market Place. Great post! Now I need to plan another trip to Minneapolis, I've obviously missed so much. That market really looks fantastic, and so does the food. I believe some Hmong people were also brought to Fort McCoy as refugees by the US Military too, but mainly it was the Lutherans that helped bring them to safety in the United States. There is a fairly large Hmong population in Western/Central Wisconsin. There are a large number of Hmong Vendors at the Dane County Farmer's Market as well. Sharona wrote: I will try to share with the future father-in-law, even though he and his partner are not very adventurous eaters. Coupled that with my vegetarian fiance, I might have to visit some of these places on my own the next time we make our way up north! Hmong food isn't all gizzards and chicken feet. I think nearly anyone would enjoy the chicken meatballs and stuffed wings. 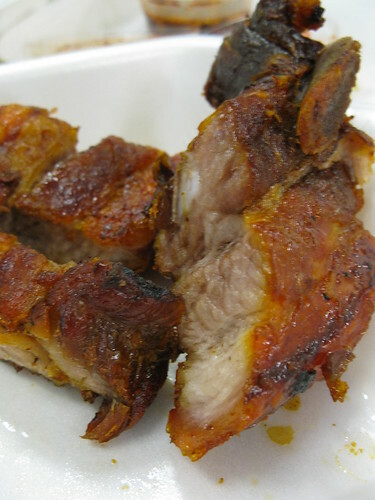 Some vendors had two types of broiled ribs (maybe a cut of short rib) that looked delicious and fairly non-challenging. My biggest regret from the trip is not trying these. As for vegetarian, I don't recall a lot of offerings but a papaya salad (without fish sauce if necessary; it's all made to order) and a bowl of rice would be a very nice lunch. There are also plenty of desserts to choose from. I would guess that in the summer, when lots of fresh produce is available, there would be more vegetable dishes. Even if not, International Market Place is still worth a visit. I forgot to mention an invaluable resource for those interested in Hmong food and culture. A few weeks ago Cooking From the Heart: The Hmong Kitchen in America was released. This is the first serious Hmong cookbook and it would be hard to imagine a better effort. The recipes look good and well presented but there is so much more. Like other great cookbooks it gives deep insight into another culture. I hope this fine book gets the attention it deserves. Highly recommended. My affiliation with the North Star State is just over a decade old, and though I've explored many culinary corners of the Twin Cities from pho to pancakes (passing through Pronto Pups) I'd never run into the International Market / Hmong Mart (the one on Como and Marion). Leave it to LTH and Rene G. to add a welcome kick of flavor to this trip. I can't add much more than pictures to the current report, except to say we did try the ribs, and they eclipsed even Sun Wah's garlic preparation. Laab (larb), one of the best cold chicken preparations I've ever tasted, wildly herby, lots of citrus, spiced to request with raw finger chili and dried pepper flakes. This woman was pounding ingredients for the papaya salad in a wonderful handmade mortar. The little food court featured five barbecue / larb food stands and four hybrid bubble tea / snack counters, and was packed at mid-day. Three other hot food counters were available in other areas of the sprawling indoor-outdoor market (including a Mini Donut booth, which apparently landed here from a State Fair season past), all exclusively staffed by women. Unpictured above, most offer homemade eggrolls most similar to Vietnamese style, filled with glass noodles, served with chili-spiked fish sauce and a sweet fruit sauce. A friend I'd eaten Hmong cuisine with at a sit-down restaurant mentioned that all of the signs are either written in English or feature large pictures of the items since, as Rene mentions, many Hmong don't really pay attention to the recently-devised script. This certainly wasn't a courtesy us outsiders (total: 3). Be prepared to break out your smiles and sign language and be richly rewarded for the effort. Thanks to Rene and LTH for the find, a won't-miss for future trips; I'm especially excited to see how the produce changes on another visit later in the season. I agree Rene that you don't need to be an adventurous eater to enjoy the Hmong Marketplace. Almost all of the stalls offer egg rolls, spring rolls, chicken wings and other very familiar fare. The ribs, as well as a number of the other meats are all generally very good. The key to this place is simply walking down the line and picking what happens to look good at the time. One vendor to the next will vary each time you go there. The 2nd or 3rd vendor from the left always has a lot more soups though and all that I've tried have been great. On another note, my friend and I happened to get into a long conversation a couple weeks ago with a woman who had just bought the space at the other end of the building that used to house the tea shop. She not only explained that she plans to open another tea shop, albeit with more mainstream teas, coffees and baked goods than the old place had, but that there are plans in the works to expand the Marketplace into several other buildings, with an emphasis on food as well as trying to encourage non-Hmong ethnic food stalls. All in all, I would encourage repeat visits not just for the way it is now, but also to check out expansions as they might happen down the road. Thanks (yet again) for an absolutely fascinating post and lesson on a little-known (at least to me) culture and cuisine. We happen to live walking distance from Sabai-Dee, the only Laotian restaurant in town and one we enjoy visiting from time to time. Do you know much about the connection--if any--between Laotian cuisine and Hmong cuisine? I had always thought that the Hmong were primarily from Laos. Saveur did a write-up on Hmong in California that fascinated me; there was a lot of discussion about the value placed on farming and gardening in this culture. Unfortunately, the article isn't online, but the photographer has some of the pictures on her website, which were breathtaking. Thanks for seeking this out and posting about it, Rene! Mhays wrote: Saveur did a write-up on Hmong in California that fascinated me; there was a lot of discussion about the value placed on farming and gardening in this culture. Unfortunately, the article isn't online, but the photographer has some of the pictures on her website, which were breathtaking. Thanks for seeking this out and posting about it, Rene! The Madison, WI farmer's market, which is the best I've ever seen, is becoming more and more dominated by Hmong farmers, and the quality and diversity of products just seems to have gotten even better as a result. Mhays wrote: Saveur did a write-up on Hmong in California that fascinated me; there was a lot of discussion about the value placed on farming and gardening in this culture. There is a modest Hmong community here in Kansas City. I toured a Hmong farmer's farm a couple years back on the Urban Agriculture Tour (coming again at the end of June!). Me, too - I don't even recognize the ones with the little sticks. And I've never seen lychees that color, ever. Peter, thank you so much for broadening my horizons! I've made frequent trips up to The Cities over the last thirteen or so years and made numerous tasty food finds. Although I was aware of a strong Hmong presence up there, I never really saw it on the surface of the Mpls/StP cultural or culinary scene. Thank you for being the explorer and bringing this thriving community into the bright light. I'll be back up that way at the beginning of July and hope to make good use of your information. Thanks for all the kind words and new information (and for the pictures, Santander). I hope many more of you will be able to make a trip to Frogtown this summer. You won't be disappointed. Santander wrote: A friend I'd eaten Hmong cuisine with at a sit-down restaurant . . .
Do you recall where that was? I was unable to find a regular sit-down Hmong restaurant. As I understand, there are several Hmong-owned places but they specialize in other cuisines. Probably a few have Hmong secret menus but I don't know which ones. Here is a fairly remarkable description of the place. Gypsy Boy wrote: Do you know much about the connection--if any--between Laotian cuisine and Hmong cuisine? I had always thought that the Hmong were primarily from Laos. Much of what follows I learned from Cooking From the Heart: The Hmong Kitchen in America, the recently released Hmong cookbook. This is an essential resource for anyone interested in Hmong food. The book is so much more than a collection of recipes though; it's a terrific introduction to a culture through its food. The Hmong lived in central China over a millennium ago but steadily migrated southward. By the twentieth century most Hmong lived in what are now Laos, Thailand and Vietnam (particularly in the mountainous regions). There are no written records of early Hmong cooking but the traditional dishes are quite simple: soups consisting of boiled meat and/or vegetables are common. Hmong cooking has been distinguished by use of a large variety of herbs. A classic Hmong dish is Nqaij Qaib Hau Xyaw Tasuaj—chicken boiled in broth with herbs. At Sun foods you can buy a bouquet of maybe half a dozen herbs, ready to be tossed in the pot with a whole fresh chicken. Another classic dish is Siab Iab—bitter pork soup—consisting of a variety of entrails boiled in broth seasoned with herbs and gallbladder juice. The beef stew I had at Sun Foods (see photos above) is a variation on this theme. As the Hmong moved into new territory they adopted and adapted the indigenous foods. Larb is a good example. There are countless versions of this dish, perhaps the signature Laotian food. Hmong cooks prepare many styles including one with Szechuan pepper. I don't believe the Laj Nqaij Qaib I had at International Market Place had this ingredient (but I bet it could be included on request). I wouldn't be surprised if Laos was the single strongest influence on Hmong cuisine. There are many more examples of similar borrowings discussed in Cooking From the Heart. I highly recommend looking at a copy. Anyplace featuring Thai and Lao cuisine is likely to have Hmong proprietors, and I've heard various (not useful) theories about why none of them call their restaurants Hmong in the subtitle / menu. *I should say, Maly's was not even presented to me as Hmong, just a good snack spot, and before learning about the market from Rene (with which my in-laws had only passing knowledge and no personal experience), had feared all of the really authentic full-flavored Hmong food was to be found only in private homes. You two have managed to put in one thread an amazing amount of information about the Hmong food scene that I think our local Minneapolis/St. Paul media has missed. If they have reported it, they haven't done so as clearly as this. I think they tend to lump it all in as southeast Asian. It is very interesting. It makes one want to further explore. Kudos to you both. Thanks so much for the tips! Really enjoyed my first foray into Hmong food, despite many prior visits to the Cities. This is a great article on my hometown. I'd like permission to repost most of it on the TC Daily Planet (take a look at tcdailyplanet.net) -- I know many of our readers would love it. maryturck wrote: This is a great article on my hometown. I'd like permission to repost most of it on the TC Daily Planet (take a look at tcdailyplanet.net) -- I know many of our readers would love it. You're welcome to any of my images or links, but Rene's got the good text and original thread idea and will have to offer explicit permission himself (you can use the PM feature if you want our names or other details). Still, why not just link to the whole thread and let your audience learn about LTHForum.com? We're on an adventure of learning ourselves. There was another great article (in "Minnesota" magazine, I believe) just published after these posts, likely prompted by the cookbook. The in-laws sent it to me; I'll link the byline and date when I get home tonight. Excellent post and all, guys. Thanks. I revisited the Twin Cities a few weeks ago. Time for an update. The Hmong market on Como has a new sign and I suppose a new official name but only a little has changed in the year-and-a-half since I was last there. I visited Hmongtown Marketplace around dinnertime and have to say the food seems more abundant and fresher at lunch. Plenty of people were eating but some the stands were in the process of closing up. It's still one of the essential destinations in the Twin Cities. There used to be another smaller Hmong market in the Golden Globe Foods building. This enticing write-up of one of the vendors, Thai-Esan Cuisine, had me enthusiastic enough to visit. Unfortunately since that Yelp review the area with the food stalls, in the blue building, has closed completely (it looks like it might be under renovation). Golden Globe Super Foods (the green building), a large Hmong-focused grocery, is still open and might be worth a visit on its own. Hopefully the food stalls will reopen sometime soon. It was only on my last day in the Twin Cities that I learned of the new Hmong market in East Saint Paul. There's a great report on the food here, though unfortunately I wasn't aware of it while I was in Minnesota. I completely changed my day's schedule so I could check this place out. I'm glad I did. It doesn't look like much from the road. Hmong Village had its official opening only a few weeks ago and already the place seems to be thriving. An old St Paul Public Schools warehouse has been completely remodeled into a huge indoor Hmong mall, much larger than Hmongtown Marketplace. It lacks the ramshackle charm of the old flea market but makes up for it in sheer quantity of offerings. Many more produce vendors in a separate large hall decorated with murals depicting Hmong village life; countless stalls selling clothing, videos, medicines and crafts; plus a much larger area selling prepared food (the picture shows only a tiny fraction of what's available). Most of the stalls have menus presented on backlit boards. From the Her family's restaurant I had a nice bowl of khaub poob* (curry noodles; $5 for nearly enough food for the entire day). But many of the most interesting offerings don't seem to be listed on the official menus. Just look around on the counters and ask. That's meat-stuffed bitter melon (dib iab ntim nqaij hau ua kua) served in a thin broth—a typical Hmong meal I think. From what I understand, the stuffing is often plain minced meat but this was sort of a spicy larb, making for a pretty zippy dish. Behind is ncuav pob kws, the classic Hmong corn bread made with whole corn kernels and sticky rice flour. I don't think the stuffed melon and bread would commonly be eaten together. One could eat here daily for months without repetition, trying many dishes unavailable in Chicago. A truly remarkable venue. I'm only upset with myself for not finding out about it before my last day. * The Hmong names may not be completely accurate. I'm doing the best I can, working from handwritten signs and labels plus my trusty (and highly recommended) Hmong cookbook, Cooking From the Heart: The Hmong Kitchen in America. For a similar total-immersion experience in a culture from yet another continent, I'd recommend a visit to Suuqa Karmel (a/k/a the Somali Mall) on Pillsbury just north of Lake in Minneapolis (there are other similar places in the area). I'll try to post in another thread on this other essential Twin Cities destination. Last edited by Rene G on September 4th, 2014, 11:44 pm, edited 1 time in total. Fantastic update post. When I first read your original post, I lamented that my frequent work trips to the Twin Cities back in 2007/2008 would have been much more interesting had I only known about these Hmong markets. Thanks for the update and I look forward to an excuse to visit St. Paul sometime soon. I was recently in St Paul with only about six hours to try to catch up on the Hmong scene. Here's a brief update. Rene G wrote: One of the most impressive shops on University is Hmong Arts, Books and Crafts, one of the world's very few Hmong bookshops (remember the Hmong written language is barely fifty years old). The original Hmong ABC store on University has closed but two new outposts at the large Hmong malls have opened. I had a chance to visit the store at Hmongtown Marketplace on Como and spoke with the founder's son, who very helpfully filled me in on the current restaurant scene. By the way, the older Hmongtown Marketplace on Como seems to be thriving and the newer Hmong Village on Johnson is doing well too. I was told the older folks prefer the more atmospheric Como mall while their children like the newer, slicker one on Johnson. I would consider one or both of these malls to be absolutely essential for anyone visiting the Twin Cities. We decided to try Destiny Café 2, located in a bland new mall a block or two north of Hmong Village. The place is really popular, with good reason. Some intriguing dishes are offered—duck pho, deep fried pig uteri and the ever-popular "cream cheese wontons"—but we decided to stick with a couple Hmong classics. Hmong sausage is available at every Hmong eatery but this version was one of the best I've had—subtly spiced, lightly fermented and freshly cooked. Laab, too, is widely available but I had high hopes for Destiny's version. It didn't disappoint. When ordering, you have a choice of raw or cooked, heat level and you're also asked how bitter you want it. Hmong cookery sometimes uses bile to add a bitter dimension to certain dishes. Our order: beef laab, raw, medium hot, bile on the side. Mixing in a bit of bile certainly changes the character of the dish, mostly in a way it's hard to pin down (maybe akin to how a dash of bitters enhances a Manhattan). It's well worth trying. This was some excellent laab. I have a feeling the meat was chopped to order, it tasted that fresh. I was sad I didn't have time to explore more of the new Hmong businesses (including several restaurants) that opened in the few years since my last visit. It's such a rich and vibrant community. I don't think Destiny Café 2's menu is available anywhere online, so here are some lousy shots to give an idea of what's offered. Howdy. I’m a regular on Dmnkly’s phxfoodnerds.com site, and have enjoyed a number of family style outings with Dom (Hue Gourmet, Little Miss BBQ, Angry Crab Shack, and the sadly closed Miu’s Cuisine to name a few). Anyways, I’m planning to set aside Thursday, May 14th for a lunch meet-up at Hmong Village, but I’ll do that in early May. As Dom will tell you, I like the spicy! In the meantime, here’s some pics to add to your thread (comments usually on the food pics if you click in). I didn't have any pushback from taking photos. The first set are Hmong Village, and then later are the Marketplace pics . . .
Mike Z wrote: Howdy. I’m a regular on Dmnkly’s phxfoodnerds.com site, and have enjoyed a number of family style outings with Dom (Hue Gourmet, Little Miss BBQ, Angry Crab Shack, and the sadly closed Miu’s Cuisine to name a few). Welcome, Mike! Thanks for the link to your photos which really show the vast scale of the two Hmong malls. I'm happy you had no problem taking pictures. It was only during my first visit to Hmongtown Marketplace (then called International Market Place) that a guard very politely asked me not to use my camera (I think he meant only in the food area). I immediately complied with his request and all the food photos in my first post were taken offsite. Your visit might coincide with the beginning of the gardening season. The absolute highlight of my several visits to the Twin Cities was the hour I spent discussing plants with an older Hmong woman, a master herbalist. Through the translation efforts of her grandson, I learned about medicinal uses of common plants as well as some I was completely unfamiliar with. The breadth and depth of her knowledge were astonishing. I wouldn't be surprised if she's still selling her beautiful plants this year at Hmongtown Marketplace.